The separation of highly radioactive minor actinides from lanthanides and other fission products within the nuclear fuel cycle is crucial in both the recycling of used nuclear fuel and as a prelude to waste storage. These separations often rely on small differences in actinide-ligand interactions, and since the 1940s, the concept of covalency in actinide-ligand interactions has been hotly debated, with minor actinides hypothesized to form partially covalent bonds involving the mixing of their 5f orbitals with ligand orbitals. 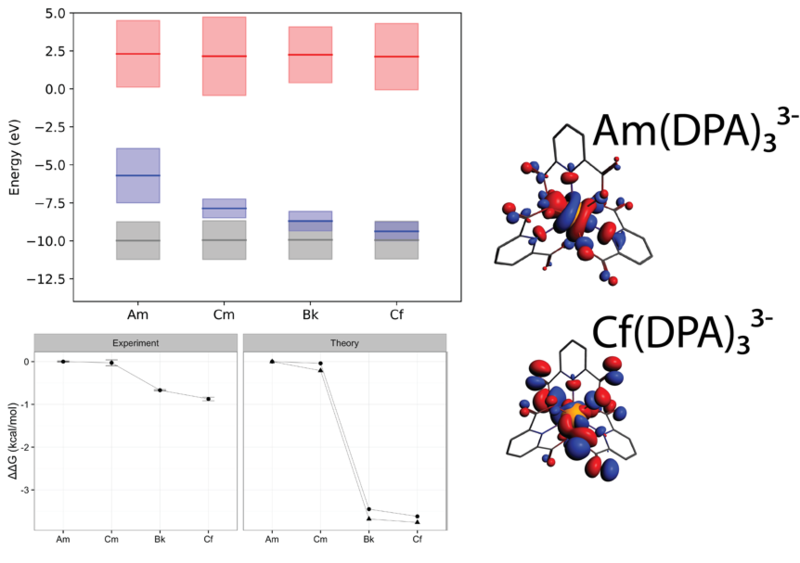 Researchers from Los Alamos National Lab investigated the bonding of mid-to-late actinide ions (Am, Cm, Bk, and Cf) with dipicolinate (DPA) ligands using relativistic density functional theory with ADF. A difference in complexation energy – verified by experimental thermodynamic measurements – was observed between Cm and Bk; this difference was found to correlate with a decrease in energy of the actinide 5f orbitals to the level of the 2p oxygen orbitals of the coordinating ligand and an accompanying delocalization of the 5f orbitals. Separations are often dependent on such small differences in complexation energy, and this energy degeneracy driven covalency may lead to new strategies in ligand design for actinide separations. Top: average energy levels of molecular orbitals composed of An 6D (red), An 5f (blue), and oxygen 2p (grey) orbitals, weighted by MO composition. Energies of the 5f orbitals decrease across the series, becoming degenerate with the ligand orbitals at Bk. Right: this corresponds with a change in 5f molecular orbitals from highly localized (Am) to delocalized (Cf), representing significantly greater orbital mixing between the An 5f and ligand orbitals. Bottom: ΔΔG (relative to Am) for the formation of the 1:3 An:DPA complex; note the difference in both the experimental and DFT data between Cm and Bk. M. P. Kelley, J. Su, M. Urban, M. Luckey, E, R. Batista, P. Yang, and J. C. Shafer, On the Origin of Covalent Bonding in Heavy Actinides, J. Am. Chem. Soc. 139, 9901–9908 (2017). Also check out the highlight on 5f covalency in Am by the same computational chemists, published two weeks earlier in the same journal.